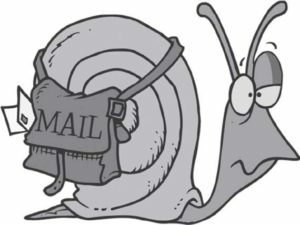 It seems that we are again getting much slower first class service on our mailings. The March issue was mailed on Feb. 21, 2018, at the Sacramento District Main Post Office at 3775 Industrial Blvd., in West Sacramento, CA. I’ve had reports of people not getting the March issue until March 20th. I’ve contacted the key people at the West Sacramento Unit and they are working to identify and resolve the issue. In the meantime, I ask everyone to make a note of the day that you receive the April 2018 issue. It’s scheduled to be delivered the Post office on March 28th. In a perfect world you should receive it by April 6 or sooner. In order to get this resolved, let us know when you receive your first class issue and if it arrived after the 10th of April, please call 1-800-ASK-USPS (1-800-275-8777) and file a complaint of late delivery of first class mail. Tell them that it was mailed on March 28th in West Sacramento as a “first class flat mail piece.” The USPS 800 number sometimes has a “long hold” time so, grab a beer, you may be on hold for a while. If enough of you complain it will force your local Postmaster to answer why it was late. I grit my teeth when our office phone rings and I hear – “where’s my issue … did you mail it? After almost 25 years of mailing the paper delivery time seems to be getting tougher every month, but I promise that we will hang in there for you guys & gals. Who was Mr. X? Clue – Mr. X was born in San Pedro, California, just six months after his father had immigrated to the United States, with his entire family, including some cousins, out of war-torn Armenia. Mr. X grew up a hard-working young man in the family’s refuse collection and hog ranching businesses, which Mr. X would later oversee. See Lew Lewis’s Turn Four Article, in this issue, to see Mr. X’s race car in Miniature … Mr. X’s name is on the side of the car. People actually read my column – remember when I asked to buy a 1959 Fury? I received a call from Kiwi in Modesto, CA and he says that I can have his convertible … an outstanding Fury … about 85 grand and worth every penny of it. I bet that you never thought these Mopars would be bringing in this kind of money, but they are … I’ll need to sell a few more thousand subscriptions before this beauty can be in my garage … Call Kiwi at 209-484-9244 to see this beauty. 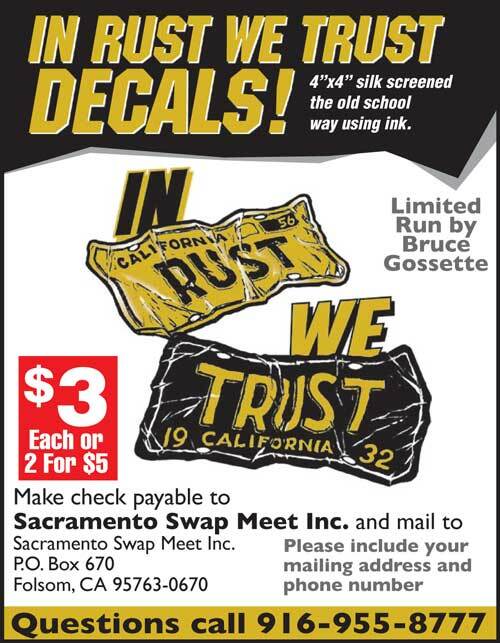 Please note there is a 4 page ad for the Sacramento Swap Meet in this issue … tear it out and bring it to Cal Expo and get a space to sell your surplus parts and/or sell your cars or trucks in the car corral April 21at Cal Expo. We now have assigned spaces and they’re 20’x20’ for $45, and unassigned 10’x18’ for $35. You don’t have to be pre-registered there is lots of room for last minute swappers … just get there before 7am on Saturday, you MUST be in your space before we open the gates to the public …it’s all about safety. See car corral app on page 36. 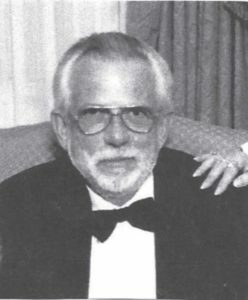 RIP Sandy Galvin … owner of Power Brake Sales in Sacramento. He was the “go to expert” in the brake world. He passed on January 23, 2018. Sandy was a fixture at our swap meet. His daughters’ Kathy Peter and Sandra Standley and son-in-law Mark Standley, will continue to operate Power Brake Sales here in Sacramento. One Final Note – The Horseless Carriage Club’s April 29th Swap Meet has been CANCELLED this year at American River College. See the article on page 25. They will be back in 2019 at a new location. ← Garage Snooping: There’s Still “Plastic” in Those Barns!